Whether you travel in first, business, or economy class, having Wi-Fi access on your flight would probably make it more enjoyable. This can be particularly important on transcontinental flights and long international flights. Some just want to be able to talk with friends or browse the web, while others are traveling for work; either way, having Wi-Fi inflight could make their lives much easier. Whether you’re looking for some entertainment or trying to finish a project, Gogo inflight Wi-Fi could be an important part of your flying experience. How Reliable Is Their Wi-Fi? Can You Stream Video Inflight? How Much Does Gogo Cost? How Do I Get Free Wi-Fi When Flying? Is Gogo Inflight Wi-Fi Worth It? Gogo is an inflight broadband Wi-Fi provider that serves 17 airlines and is installed on roughly 2,500 planes. The Gogo inflight network allows travelers to access the internet to respond to emails, read the news, and much more. Airlines from around the world utilize Gogo to provide Wi-Fi access for their passengers. The Gogo inflight network stretches across most of the globe. Image courtesy of gogoair.com. The Gogo inflight network has improved significantly since it was first launched on commercial aircraft nearly 10 years ago. That being said, Wi-Fi speeds remain inconsistent since many planes are still outfitted with air-to-ground (ATG) systems. This is significantly slower than Gogo’s newer satellite system. On planes using the older ATG systems, load speeds can become frustratingly slow if most people on your flight decide to use Wi-Fi. Since T-Mobile partners with Gogo to provide its customers 1 hour of Wi-Fi for free, this can result in what amounts to a traffic jam on the inflight network. 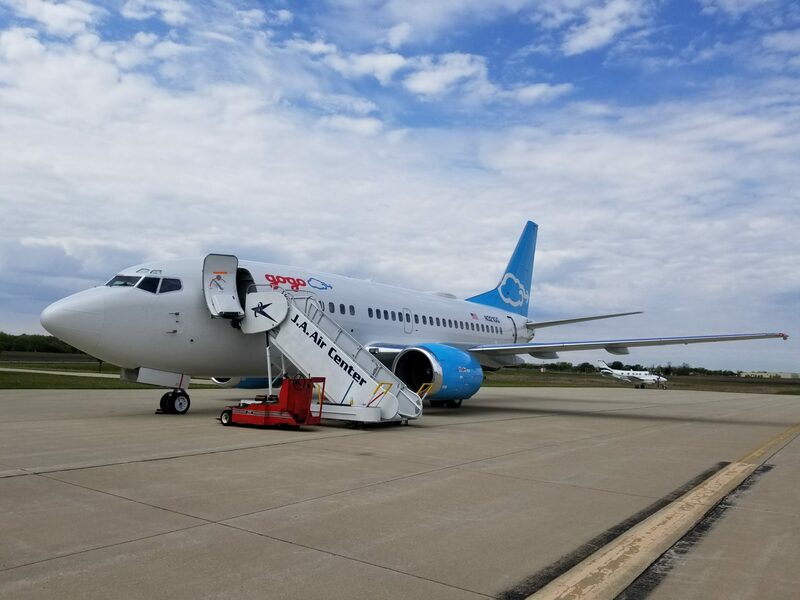 As Gogo rolls out its newest product, a satellite system known as 2Ku, we hope to see better speed and reliability across the board. 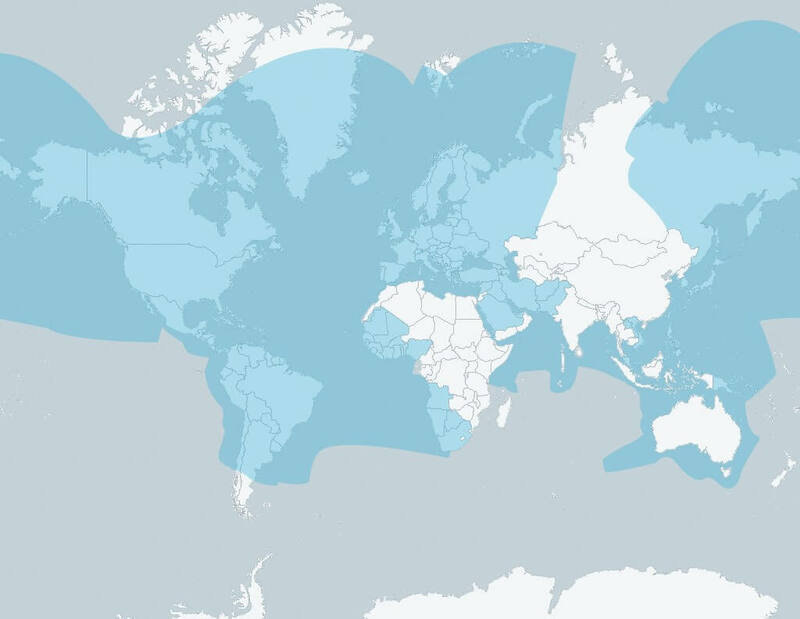 Finally, keep in mind that the Gogo network does not cover the entire globe. If you’re on a long-haul flight, there’s a good chance you’ll cross through a dead zone at some point and lose Wi-Fi access during that part of your flight. Unfortunately, if your flight is utilizing the ATG system, it is not possible to stream video. There is good news, though! The newer 2Ku satellite system does support video. Hopefully, this means we will be able to stream videos of our choosing soon! If you travel regularly, it might make sense to purchase a Gogo subscription plan. 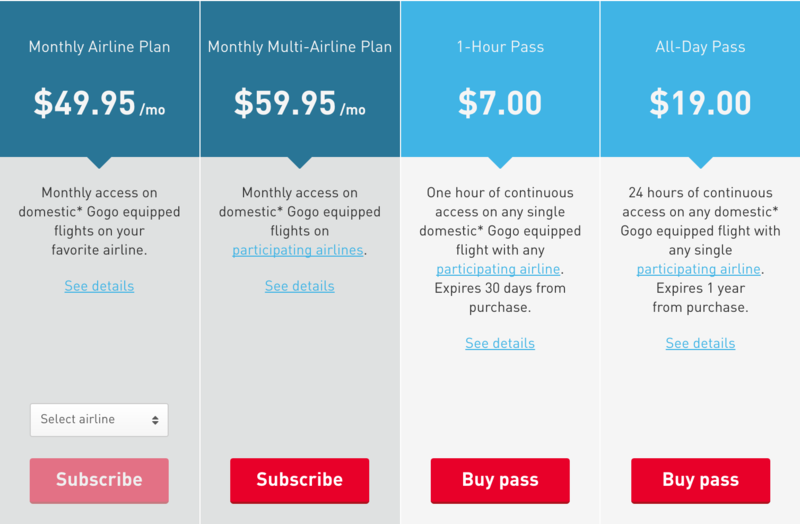 Gogo allows you to purchase internet passes and plans prior to flights. If you forget to do so before your flight, you can still purchase a pass inflight. Make sure you read the details about each plan to ensure it covers your needs. If you have a lot of upcoming domestic travel, a global plan might not be necessary. If you will be traveling internationally, though, a global plan would be vital. Currently, 6 of Gogo’s airline partners participate in these plans: Air Canada, Alaska Airlines, American Airlines, Delta Air Lines, United Airlines, and Virgin America. If you need a short-term internet pass, Gogo has you covered with a few options. You can also purchase an internet pass prior to your flight. 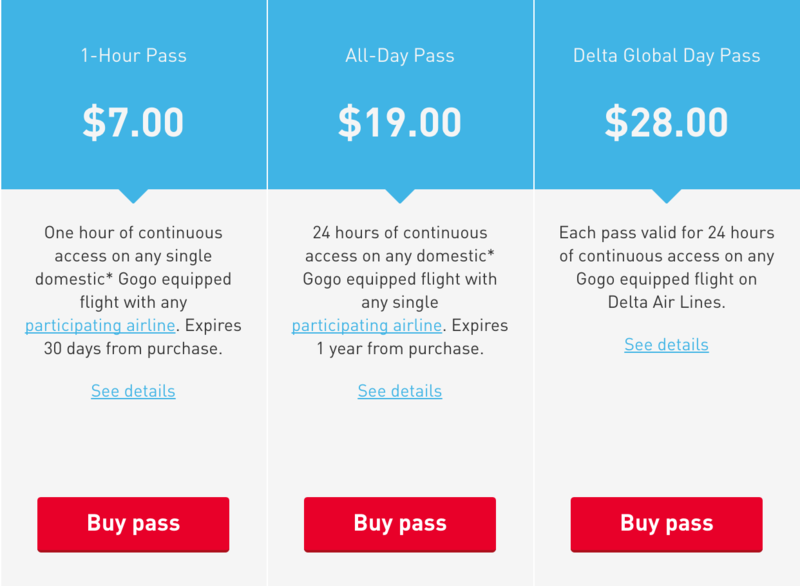 There are 3 options: a 1-Hour Pass, an All-Day Pass, and a Delta Global Day Pass. As you can see from Gogo’s pricing plans above, inflight Wi-Fi is not cheap. Fortunately, there are a couple credit cards that provide Gogo Wi-Fi passes as part of their perks. If you have The Business Platinum Card® from American Express, you get 10 Gogo passes annually. Even if you will need more Gogo Wi-Fi passes, knocking out some of the cost is a great benefit from these cards! The Business Platinum Card® from American Express also provides access to Boingo hotspots in many airports if you need Wi-Fi while waiting for a flight. Whether purchasing Gogo’s inflight Wi-Fi is worth it to you will be determined by several factors. Business travelers with tight deadlines might find internet access a must on all flights. However, leisure travelers on short flights might see the price and decide they’d be happy to read a book instead. At this point, almost all travelers expect access to an inflight Wi-Fi network. Gogo continues to roll out a better product, but it’s not cheap. However, staying connected to the world outside their plane can be valuable to travelers of all sorts. Don’t forget that some credit cards like The Business Platinum Card® from American Express provide internet passes that can help with the cost! What is Gogo inflight internet? Gogo provides inflight Wi-Fi service on nearly 2,500 planes across 17 commercial airlines. How do I use Gogo Wi-Fi? You can purchase a pass or a plan prior to or during your flight. How much is an internet pass with Gogo? Prices vary, from a 1-hour pass for $7 to over $700 for an annual subscription plan with Wi-Fi that can be used on several airlines. Currently, Gogo operates 2 different inflight Wi-Fi systems. One is an air to ground (ATG) system while the other is a satellite system. Gogo is in the process of rolling out the latest satellite system (2Ku) that will be the fastest inflight Wi-Fi available. Can I stream video with Gogo? Gogo does not currently support inflight video streaming. However, their 2Ku satellite system has the necessary speeds to allow travelers to watch videos. Hopefully, video will soon be a standard part of inflight Wi-Fi. Don’t miss out on the 41 benefits of this card and how we easily get $1,250 per year in value, such as access to over 1000+ airport lounges, (including the amazing Amex Centurion® Lounges) complimentary Boingo wifi access ($468 value), 10 GoGo Inflight wireless passes ($160 value), $200 Airline Fee Credit and more. Gogo Inflight has to be the worst service in any industry on the planet. Consistently and persistently slow or frozen, repeated dropped connections. If they were honest, they would shut it down or at least run banners that you are going to be wasting your money and time. Every penny spent on Gogo Inflight is $10 too much! Hey Christopher – thank you for sharing your experiences with GoGo Inflight…and sorry to hear that they cause you so many issues. Hopefully they will continue to improve as there’s definitely competition around.